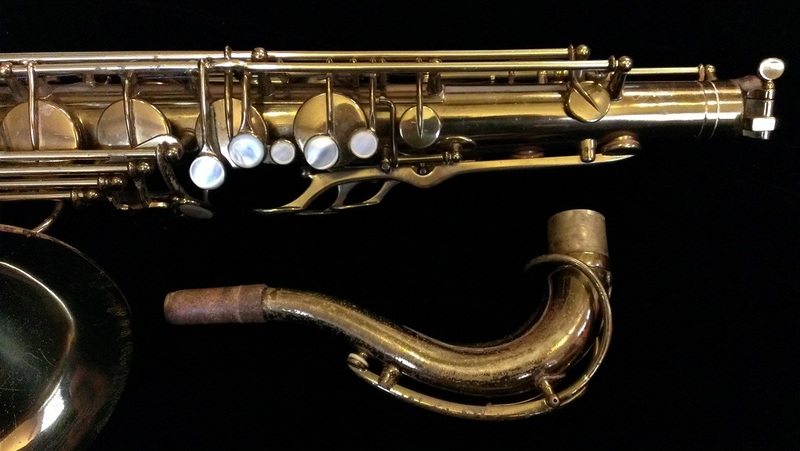 This is a 1939 Selmer Balanced Action tenor saxophone, serial number 292xx, made in tail end of the final year before World War II decreased Selmer’s output to a trickle. It is the twin to my personal alto from the same time period, and I am sorely tempted to keep it, but I already have a great tenor and if I keep all the horns I want to keep I wouldn’t have a home to keep them in. Besides, there are not many Balanced Action tenors still around, and this one should be out making music somewhere. 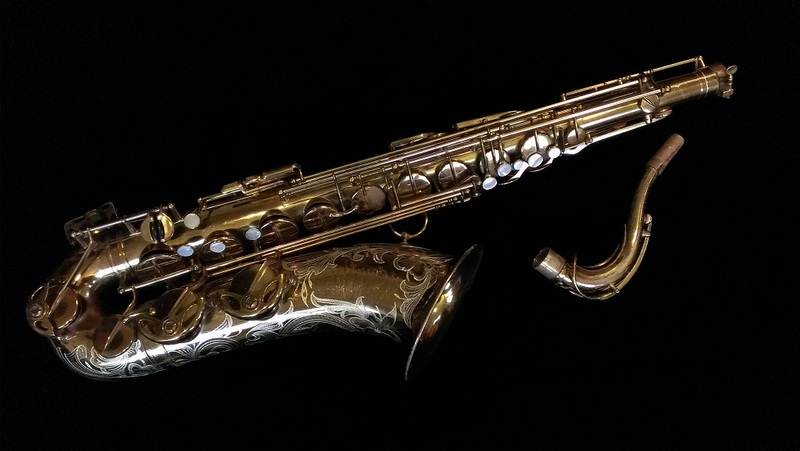 This particular saxophone is a well-done old factory relacquer with the correct dark brown nitrocellulose lacquer- I’d guess it was done in the 1940s- and then beautifully re-engraved much more recently by Sherry Huntley. 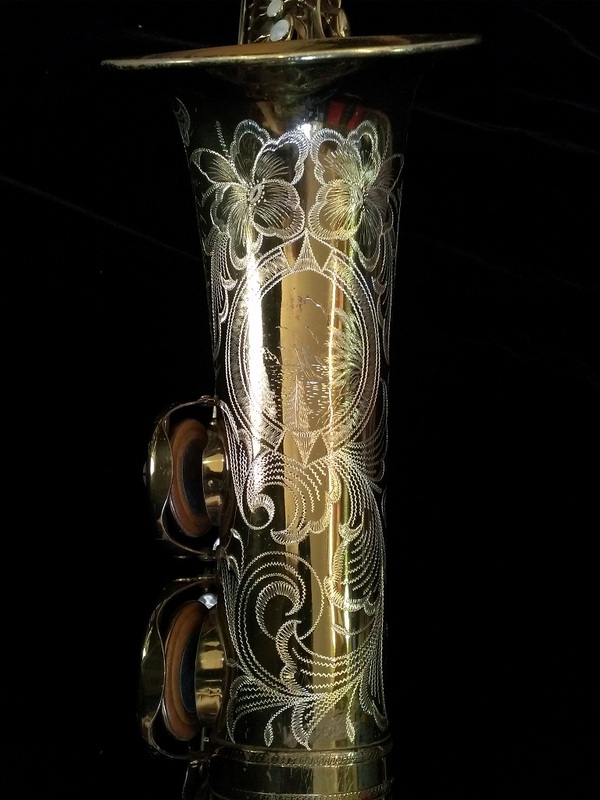 This saxophone will receive a full mechanical rebuild (a $1300 value), and under the fingers and to the ears and to all but the most practiced eye will look and feel original- or in the case of the mechanics, better than original, as all wear done to the mechanics by the buffing portion of the relacquering process can and will be healed. The body is in good physical shape, and the lacquer is in very good condition, with about 85% coverage. The Balanced Action is my favorite Selmer model: they feel fantastic under the fingers and have a dark, powerful, rich and beautiful sound that is hard to find anywhere else. 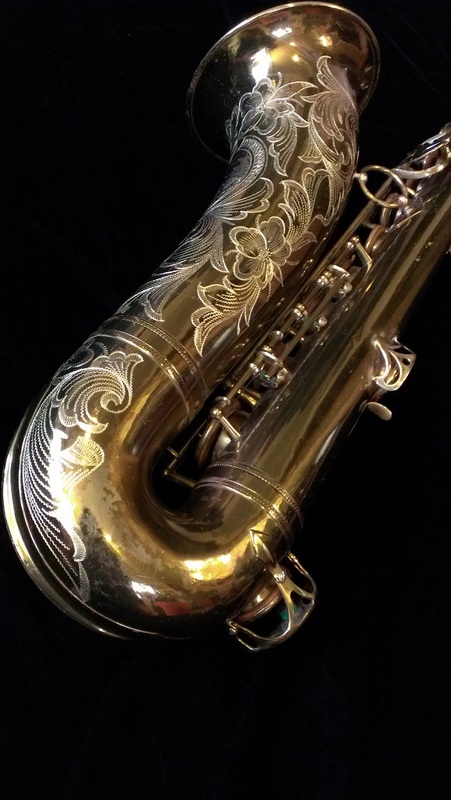 The Balanced Action design is the design from which all modern saxophones (including the Mark VI) have sprung, and with good reason. It is well thought out, well crafted, well implemented, and light years ahead of everybody else at the time which means it feels modern under the fingers even today- truly an inspired piece of saxophone design. This particular horn features the lower stack adjustment screws on the key feet (same as my alto) and they are all present and in good functional condition. This saxophone currently has its original metal Tonex resonators, which I will re-install. This horn comes in a non-original but functional hard case, though I might suggest pairing it with a BAM case, which I can hook you up with. This horn is scheduled for an overhaul, which is included in the price. If you reserve it before I finish it, you can have the overhaul done to your specifications.